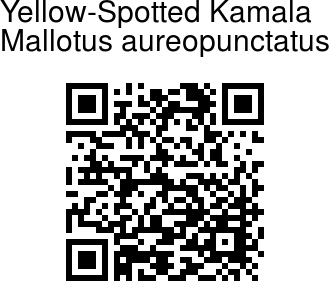 Yellow-Spotted Kamala is a tree up to 5 m tall. Branchlets are round, minutely velvety to hairless. Oppositely arranged leaves occur in unequal pairs, 9.5-19.5 x 2.6-7 cm, elliptic-lanceshaped. Leaf-stalks are up to 1.5 cm long, grooved. Tip is long-pointed, often falling off. Base is narrow or broad, margins are widely undulating or toothed. Leaves are resinous yellow glandular on the underside. 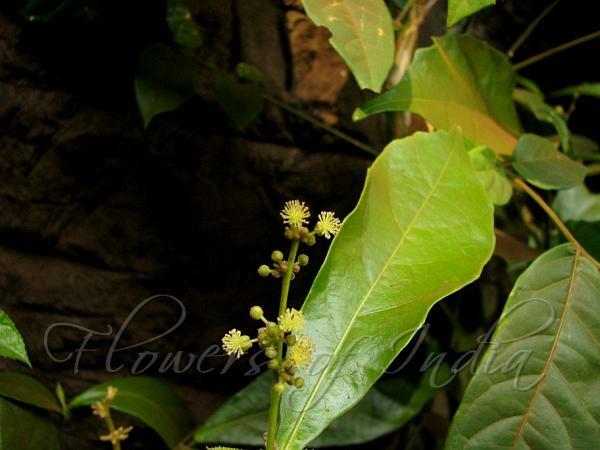 Flowers are unisexual, inflorescence racemes, shorter than leaves. Capsules are 3 lobed with hard conical spines, to 1.5 cm across. Yellow-Spotted Kamala is occasionally found in the understorey in evergreen forests up to 1600 m. It is endemic to the Western Ghats- South and Central Sahyadris.